Saturday was ‘Implementation Day’ for the Iranian nuclear deal. 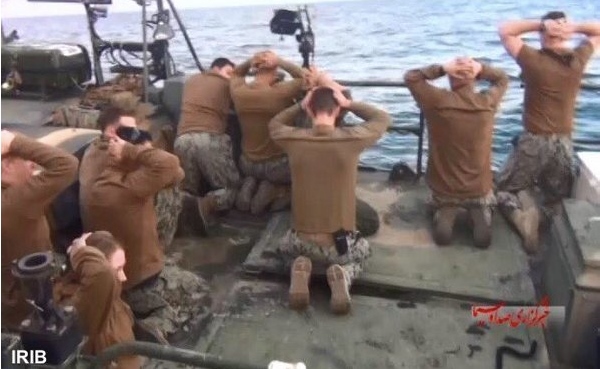 Someone referred to it as ‘humiliation day’ for America, because the humiliating surrender in the diplomatic battle to keep Iran from obtaining nuclear weapons was accompanied by the humiliation of American sailors forced to kneel to their Iranian captors, as well as the humiliating exchange of actual criminals for still more hostages. Oh, and by the way, Iran “doesn’t know” what happened to the Jewish hostage, Bob Levinson. They lost track of him in a cellar somewhere. I didn’t mention the humiliation of doing nothing when Iran fired missiles near Navy ships or tested forbidden ballistic missiles, because those things happened before Humiliation Day. But they were still humiliating. The photos and video of the US sailors kneeling with their hands on their heads was shocking to me. I wondered, do Americans know what they are seeing? I suspect that most of those in the military do. And so does everyone in the Middle East, both places where the concept of honor is still important. The United States gave up its honor when it compromised on the substance of the deal – and in the process, wrecked the carefully constructed edifice of the non-proliferation regime – in order to advance the president’s goal of rapprochement with Iran and withdrawal of American power from the Middle East. And it compromised the honor of the military when the administration instructed the commander of the captured boat to violate the Code of Conduct that he had sworn to uphold. I don’t know which was worse: the transparent story (see also here) made up to spin the incident as something other than a deliberate slap in the face from the triumphant Iranian regime, or John Kerry’s abject debasement as he thanked the Iranians for not hurting the hostages they took in violation of international law. I’ve written this before, but it bears repeating: many Westerners don’t understand the importance of protecting one’s honor. Once you allow an antagonist to violate your red lines, no matter by how little, then he knows that can push a little harder the next time. Police officers know that overlooking ‘beer runs’ leads to armed robberies, aggressive panhandling is a precursor to mugging, and petty shoplifters become looters. There once lived a rich and powerful man. One day, bandits stole a water jug; but instead of taking it back and punishing the bandits — which would have been easy, since he had many sons — he said “it’s only a jug, it’s not worth a fight. Anyway, I have more jugs.” Then they took a goat. “Oh well, I have more goats, and after all the bandits were hungry,” he said. One day he woke up to find that they’d killed his sons, taken his goats, his camels, his tent and his wives to boot. Then, since he had no goods, no sons and no honor, they killed him. The Iranians, the Russians, the Saudis and the Israelis all understand that the US behaves like a man without honor. If they couldn’t tell from way Kerry surrendered on point after point in the nuclear negotiations, they knew it when Obama threatened Bashar al-Assad over his use of chemical weapons and then didn’t follow through. Some have suggested that Barack Obama wants to make America more like Europe. If the behavior of European states in the face of what is essentially a mass invasion of ideologically-aware Muslim migrants is taken as an indication, Americans should worry. One of the most common ways to drain a nation’s honor is to sexually attack its women. The epidemic of sexual attacks and harassment in Europe isn’t accidental. In Israel, some people understand and some don’t. Those who remember life in Arab countries certainly do, but even an Ashkenazi like Avigdor Liberman gets it. Let’s be honest: most Israelis believe that perpetrators of stabbing and car-ramming attacks should be shot, even those who merely attempt such acts. This isn’t because of a need to take revenge or because they feel that the punishment that terrorists get if captured is inadequate (although it is), but because honor requires it. In the West, except in certain subcultures like the military, the concept of honor is less prominent than in the Middle East. But it is real, buried deeper then the modern ideas of pragmatism and the principle that anything that doesn’t hurt someone is permissible. The Marxist heritage of the Left, to which Obama (and Hillary Clinton) belong, is entirely pragmatic. The end always justifies the means, and there is no truth, only utility. Honor has no place here. A politician who doesn’t understand the importance of honor will not do well in Israel. This is one reason that Isaac Herzog will probably never be Prime Minister. And it’s one of the reasons Menachem Begin is revered. It would not be a bad thing if Americans would start to take it seriously as well. This entry was posted in American politics, Iran. Bookmark the permalink.